One of the most eminent museums of art and design hides its focus behind a name which doesn’t even mention it’s a museum anymore. It was founded in 1852 as the Museum of Manufactures using the profits from the Great Exhibition and was renamed the South Kensington Museum in 1857 when it moved to its current location. In 1899 Queen Victoria laid a foundation stone for a grand facade and the museum was renamed again as the Victoria and Albert Museum. Its logo, website and branding just call it ‘The Vee and Ay’ (well, V&A). Entering through the grand facade Queen V laid the stone for you encounter an amazing glass sculpture by Dale Chihuly hanging over the main ticket and information counter. I suspect that before it was installed, the clock overlooking the same hall was the main focus. The permanent collection is a wonderful mix of useful and beautiful items from around the world. The building itself also being a magnificent example of design, architecture and craftsmanship. On entering the central courtyard from the sculpture gallery you see this facade across a lawn and pond. The permanent exhibition is free to visit (donations are encouraged) so the museum is always full of people of all ages and children are often playing in the water. 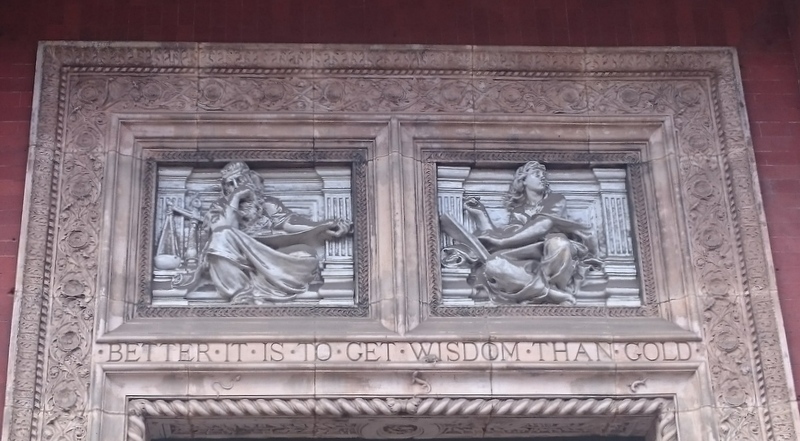 The inscription over the door in the middle of the picture above encourages education; the doors themselves commemorate great scientists and engineers. Once you’ve passed through these doors you are in the cafe decorated with the most amazing tiles and stained glass. In the afternoons there is even a pianist to accompany your afternoon tea and scones with jam and clotted cream.